Many stories emerging from the Francis Marion National Forest share a common genesis in Hurricane Hugo, the massive storm estimated to have knocked down nearly a billion board feet of timber on the coastal South Carolina forest in 1989. But in a comeback success story, there was no knock-out for the red-cockaded woodpecker. Before Hugo, the Francis Marion had the densest, second-largest, and only known, naturally increasing population of red-cockaded woodpeckers in the country. Prior to 1989, an estimated 475 breeding pairs lived on the forest. The endangered bird is the only woodpecker in the United States that builds its nest cavity in living pine trees. The bird is dependent on mature, fire-maintained pine woodlands for its survival. 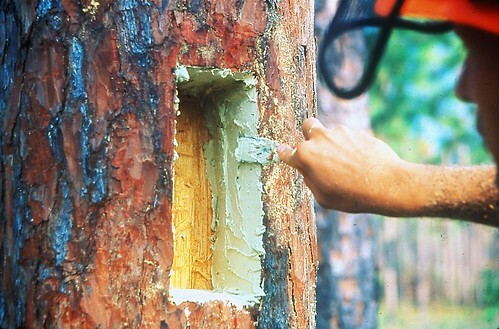 The lack of potential trees for cavity excavation is one of the main reasons that the species is endangered. The hurricane’s sustained 130 mph winds likely wiped out more than half the woodpecker’s population in a single night, destroying nearly 90 percent of cavity trees on the forest. Where the storm hit hardest, only some cypress and a few hardwoods were left standing. Many biologists feared that the population would never recover to its former glory. 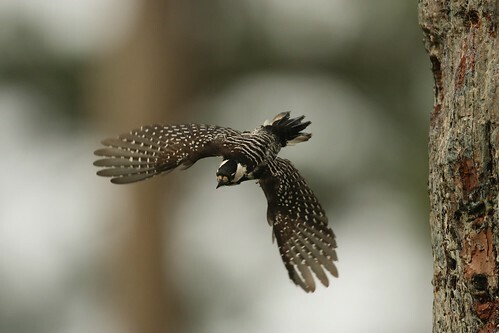 Fortunately, researchers from North Carolina State University and the Forest Service’s Southeastern Forest Experiment Station (now called Southern Research Station) were already pioneering the use of artificial cavities to sustain the population of endangered birds. At this year’s start, through aggressive habitat management and the installation of more than 2,800 artificial cavities, the woodpecker’s population has rebounded to approximately 439 active clusters with about 426 confirmed potential breeding groups, exceeding the U.S. Fish and Wildlife recovery plan goal for the forest of 350 potential breeding groups. “Cluster” refers to the aggregation of cavity trees that are claimed and defended by a group of woodpeckers. A “potential breeding group” refers to a cluster that includes an adult male and adult female. A typical cluster averages three or four birds — the breeding pair and “helper” birds, usually male offspring who remain to help raise the young. Female offspring typically disperse to look for new territory in which to nest. The woodpecker’s population on the forest is expanding, especially in the core burn area, parts of the forest that are consistently burned on a two- or three-year interval. Despite the fact that more than a third of the bird’s clusters on the forest forage at or below the managed stability standard, the population continues to grow naturally. In fact, the forest supports one of the most robust populations in the United States, truly a testament to the resiliency of this species.